If you are Subaru owner who likes to tackle maintenance and repair jobs yourself, congratulations! It takes skill and courage to master your own automotive projects. Michael Hohl Subaru, also serving the Lake Tahoe area, can help. We are the ideal place to get all of the Genuine Subaru Parts you need to do the job right the first time. Genuine Subaru Parts have been designed and manufactured for and by Subaru for precise fit in every Subaru model on the road and in our showroom. 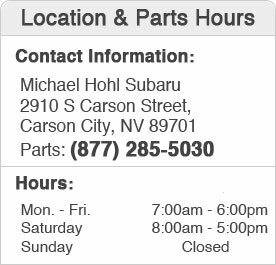 Michael Hohl Subaru, located close to Sparks and Gardnerville, maintains an extensive, well-stocked inventory of Genuine Subaru Parts and Accessories for your convenience, and can quickly order anything you need that's out of stock. We also carry a full line of Genuine Subaru Chemicals. Just like Subaru's parts and accessories, Subaru's chemicals have been designed to do the best job of lubricating, cleaning and facilitating all aspects of Subaru vehicle performance. Subaru has tested every product with their name on it to ensure it will do exactly what it should do when used in your Subaru model. Using Genuine Subaru Parts, Accessories and Chemicals removes the guesswork. Why Not Save Time and Money by Using Aftermarket Parts in My Subaru? Subaru enjoys a well-deserved reputation for durable and reliable cars and SUVs. Since Subaru vehicles are the sum of their parts, integrated into an exceptionally-engineered whole, it makes sense that Genuine Subaru Parts will integrate seamlessly into the model you are driving. It also makes sense that they will provide the same consistent performance you expect from your Subaru for years to come. All extended warranties on your Subaru require the use of Genuine Subaru Parts because Subaru can only stand behind what they make. By using Genuine Subaru Parts, you are ensuring that the newly installed parts will work precisely with every corresponding part in your Subaru and maintain the strength of the system involved, whether it's the brakes, transmission, engine or chassis. Genuine Subaru Parts not only fit better, but they are higher quality. Genuine Subaru brake pads withstand extreme heat better and wear more evenly. Genuine Subaru brake rotors resist rust much better than aftermarket products. Genuine Subaru Accessories will also fit perfectly in the model you wish to enhance with practical or stylish upgrades. .Whatever the do-it-yourself task the time and energy you invest will be gone. Your payback is money saved on the labor and a car or SUV that works perfectly for as long as possible. If you have to do the job again because an aftermarket part didn't fit properly or the repairs don't stand the test of abuse and time, you haven't saved anything in the end. Subaru wants you to be delighted with your purchase for as long as you have the car or SUV, so they will continue to make Genuine Subaru Parts that help accomplish that goal. Michael Hohl Subaru is pleased to provide trained Parts Specialists who are ready to help you find the exact Genuine Subaru Part or Accessory you need, no matter what it is. If we don't have it in stock, we will get it for you. We offer monthly specials and discount coupons to reduce the cost of automotive maintenance and repairs and help you save even more money on Genuine Subaru products. Our factory-trained, certified Service Technicians will gladly install any parts, accessories or chemicals purchased in our Parts Store for an additional fee. Feel free to call and speak with one of our Parts Specialists to ask any questions. We can be reached at (877) 285-5030 and are happy to be of service. You can also fill out the online Parts Request form if you know exactly what you need and we will contact you promptly. We are conveniently located at 2910 S. Carson St., Carson City, NV 89701. Let us help meet your automotive needs.